I promise you didn’t know corn on the cob, especially grilled for just 12 minutes, could be this good. The secret? Paprika and Parmesan. If you’ve never used paprika before, now is the time to start! Sweet summer corn on the cob grilled with butter is delicious. But you’ll never want it that way again after you try it Italian-style, with garlic, smoked paprika, and Parmesan cheese. 1. Preheat the grill for direct cooking over medium heat (400F). Brush the cooking grates clean. 3. 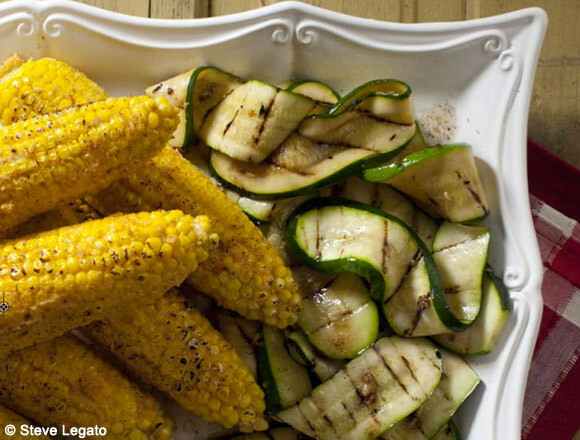 Place the foil-wrapped corn on the cooking grate and cover with the grill lid. Cook, turning occasionally, until the corn is heated through with some toasted browned spots (open the foil to check), 12 to 15 minutes. Transfer the foil-wrapped corn to a platter. 4. Unwrap the corn and return to the platter. Serve hot, allowing each person to sprinkle the corn with Parmesan cheese and salt to taste before eating. You have caused me to rethink my cooking habits young lady. I follow you on twitter and thank you for following me. If you get the chance check out my work: vineyardfaux.com and photobucket.com/j419vineyardfauxcom. You are very talented. Keep up the great work! Yum! Simple recipes and fresh ingredients (ingredientses? hehe) make the best food. Thanks for this. Wish I had a twitter, I love reading your tweets but can’t quite bring myself to make an account (already have too many distractions! ).